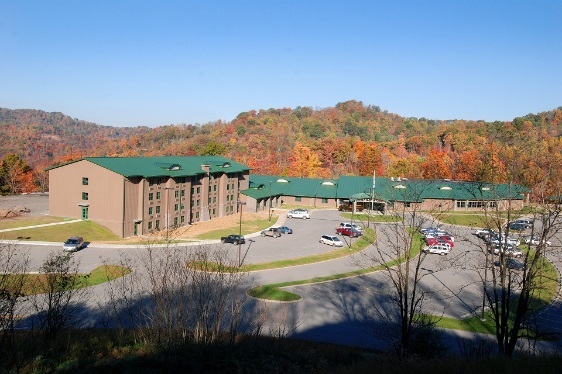 Chief Logan Lodge, Hotel and Conference Center is the newest lodging addition to the West Virginia State Parks system. Offering superior customer service, 75 modern rooms and suites, guest laundry, indoor pool, fitness room, and hot tub, this overnight facility is a welcome addition for travelers of US 119. The hotel and conference center are conveniently located to the Hatfield McCoy Trails and trail passes are offered at the front desk. Chief Logan Lodge has wireless internet access throughout the facility as well as cellular hot spots – a communication convenience at West Virginia’s new state park lodge. Overnight guests of Chief Logan Lodge enjoy a complimentary continental breakfast from 6:30 a.m. – 9:30 a.m. daily. The Continental breakfast is included in room rental rates. Chief Logan Lodge is a smoke free facility. Pets are permitted in designated lodge sleeping rooms. This room type is not available as an online reservation option. Please call for pet-friendly reservations. Overnight guests of Chief Logan Lodge have access to Chief Logan State Park swimming pool and water slide. https://us01.iqwebbook.com/CLLWV900/ button located on this page.